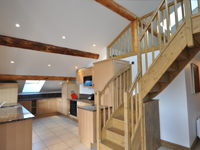 Le Cochet Penthouse is a luxury apartment located in St Martin de Belleville, the jewel of the Three Valleys. 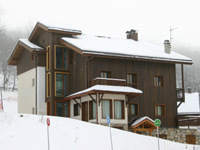 Located within a stone's throw of the St Martin Ski station it offers true ski-in / ski-out access to the best ski area in the world via express gondola. The apartment has more than enough space to accommodate 8 people in comfort, offers fully specified luxury accommodation with contemporary furnishing and decoration. Three double bedrooms, each with ensuite bathrooms, provide spacious accommodation for 6 people, whilst additional 'roll-under' beds and a double sofa bed on the mezzanine provide 10 bed spaces in total. After a day on the slopes, the historic market square with its baroque church, Michelin-listed restaurants and bars is a 5 minute walk. If you fancy a night in, however, then the fully equipped kitchen and elegant dining space allow for the preparation of gourmet dinners and lively family banquets. The sumptuous leather sofas are then perfect for deserved relaxation in front of a DVD, listening to music, or games in front of the log-burning fire. When the bedroom calls, you can sink your head into the soft pillows and drift off into a blissful night on comfort mattresses swathed in Egyptian cotton.